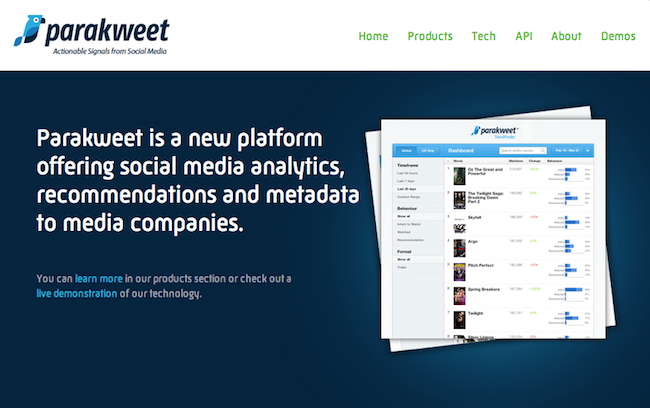 Parakweet Inc, a startup offering social media analytics, recommendations and metadata to media firms, has raised $2 million in angel funding. The funding was led by a group of investors including Scott Banister, an early investor in PayPal; Alan Braverman, co-founder of Yammer; David Jeske, former director of engineering at Google, and Vikas Taneja, senior partner and MD of The Boston Consulting Group. Other angel investors and entrepreneurs also took part in this round. The money raised will be used for further development of BookVibe, the startup's recently launched book discovery engine, as well as other product innovations. "We started Parakweet to distil actionable insights from the unstructured language of social media. With this funding, we have taken a step to transform how meaning and understanding is derived from massive amount of social media data, which often includes slang, abbreviations and no punctuation (something that the company is solving via natural language processing)," said Ramesh Haridas, co-founder and CEO of Parakweet. The San Francisco-based startup was founded by Haridas and Kiam Choo (CTO) back in 2010. Prior to Parakweet, Haridas also founded two other startups including an online ad network Chintano (sold to Datran Media) and PrivacyBank.com (sold to Infospace). He is also an active angel investor and has invested in companies like 8tracks, Accumo and nRelate. The current team size of the startup is six. The company has developed a proprietary artificial intelligence platform that uses social media-specific natural language processing (NLP) to detect and extract meanings from millions of unstructured conversations and identify consumer behaviour, intent and sentiment. Furthermore, the Parakweet platform does not require users to join it or recreate yet another social network. Its first consumer-facing product, a social discovery & book recommendation engine called BookVibe (launched in beta this year), scans a user's Twitter stream and extracts tweets which are actually about books. It also detects and distinguishes the person's sentiment about those books. For example, if a tweet reads, "I am reading War and Peace since the weather is lousy", BookVibe understands that 'lousy' refers to the weather and not the book. Some of the behaviours that BookVibe identifies include 'intent to read', 'read' and 'recommend'. "We are providing consumers with book recommendations based on a user's personal interests and the interests & affinities of the people they follow. Our platform also allows companies to tap into the behavioural signals consumers are generating across social media and uncover actionable and competitive insights," added Haridas. "Parakweet's technology gets under the hood of social media language and captures human behaviours with remarkable accuracy. Books and movies are just the tip of the iceberg for applications of Parakweet's natural language processing engine," said Banister. As for competition, the startup locks horns with the likes of Shelfari, Riffle, Radian6 and Crimson Hexagon.